The Audi TT is a 2-door sports car marketed by Volkswagen Group subsidiary Audi since 1998, and now in its third generation. The first two generations were assembled by the Audi subsidiary Audi Hungaria Motor Kft. in Győr, Hungary, using bodyshells manufactured and painted at Audi's Ingolstadt plant and parts made entirely by the Hungarian factory for the third generation. For each of its three generations, the TT has been available as a 2+2 coupé and as a two-seater roadster employing consecutive generations of the Volkswagen Group A platform, starting with the A4 (PQ34). As a result of this platform-sharing, the Audi TT has identical powertrain and suspension layouts as its related platform-mates; including a front-mounted transversely oriented engine, front-wheel drive or quattro four-wheel drive system, and fully independent front suspension using MacPherson struts. The styling of the Audi TT began in the spring of 1994 at the Volkswagen Group Design Center in California. The TT was first shown as a concept car at the 1995 Frankfurt Motor Show. The design is credited to J Mays and Freeman Thomas, with Hartmut Warkuss, Peter Schreyer, Martin Smith and Romulus Rost contributing to the interior design. A previously unused laser beam welding adaptation, which enabled seamless design features on the first-generation TT, delayed its introduction. Audi did not initially offer any type of automatic transmission option for the TT. However, from 2003, a dual clutch six-speed Direct-Shift Gearbox (DSG) became available, with the United Kingdom TT variants becoming the world's first user of a dual clutch transmission configured for a right-hand drive vehicle, although the outright world first for a road car equipped with a dual clutch transmission was claimed earlier by a Volkswagen Group platform-mate, the left hand drive Volkswagen Golf Mk4 R32. The Audi TT takes its name from the successful motor racing tradition of NSU in the British Isle of Man TT (Tourist Trophy) motorcycle race. NSU marque began competing at the Isle of Man TT in 1907 with the UK manager Martin Geiger finishing in fifth position in the single-cylinder race. The 1938 Isle of Man Lightweight TT race was won by Ewald Kluge with a 250 cc supercharged DKW motor-cycle and the DKW and NSU companies later merged into the company now known as Audi. The Audi TT also follows the NSU 1000TT, 1200TT and TTS cars of the 1960s in taking their names from the race. The TT name has also been attributed to the phrase "Technology & Tradition". The production model (internal designation Type 8N) was launched as a coupé in September 1998, followed by a roadster in August 1999. It is based on the Volkswagen Group A4 (PQ34) platform as used for the Volkswagen Golf Mk4, the original Audi A3, the Škoda Octavia, and others. The styling differed little from the concept, except for slightly reprofiled bumpers, and the addition of rear quarterlight windows behind the doors. Factory production commenced in October 1998. Early TT models received press coverage following a series of high-speed accidents and the related fatalities which occurred at speeds in excess of 112 mph (180 km/h) during abrupt lane changes or sharp turns. Both the coupé and roadster variants were recalled in late 1999/early 2000, to improve predictability of the car's handling at very high speeds. Audi's Electronic Stability Programme (ESP) or Anti Slip Regulation (ASR) and rear spoiler were added, along with modifications to the suspension system. All changes were incorporated into subsequent production. The Audi TT was nominated for the North American Car of the Year award for 2000. It was also on Car and Driver magazine's Ten Best list for 2000 and 2001. By 2003, Audi had provided a "face-lift" to the TT, with a number of small styling and practicality improvements. Production of the Audi TT (Type 8N) ended in June 2006. Mechanically, the TT shares an identical powertrain layout with its related Volkswagen Group-mates. The TT uses a transversely mounted internal combustion engine, with either front-wheel drive with 'quattro four-wheel drive' available as an option. It was first available with a 1.8-litre inline four-cylinder 5-valve turbocharged engine in two states of DIN-rated power outputs; 180 PS (132 kW; 178 hp) and 225 PS (165 kW; 222 hp). The engines share the same fundamental design, but the 225 PS version features a larger K04 turbocharger (180 PS version came with a smaller K03S), an additional intercooler on the left side (complementing the existing right-side intercooler), larger 20mm wrist-pins, a dual tailpipe exhaust, intake manifold with inlet on driver's side, and a few other internals – designed to accommodate the increase in turbo boost, from roughly 10 pounds per square inch (0.7 bar) peak, to 15 pounds per square inch (1.0 bar). Haldex Traction enabled four-wheel drive, 'branded' as "Quattro" was optional on the 180 engine, and standard on the more powerful 225 version. The original four-cylinder engine range was complemented with a 3,189 cc (3.2 L; 194.6 cu in) VR6 engine rated at 250 PS (247 bhp; 184 kW) and 320 N⋅m (236 lb⋅ft) of torque in early 2003, which came as standard with the quattro four-wheel-drive system. In July 2003, a new six-speed dual clutch transmission – dubbed the Direct-Shift Gearbox (DSG), which improves acceleration through much-reduced shift times, was offered, along with a stiffer suspension. In 2005, Audi released the Coupé-only limited edition (800 sold in the UK, not the 1000 originally planned) Audi TT quattro Sport (known as the Audi TT Club Sport in Europe). Built by AUDI AG's high-performance specialist subsidiary quattro GmbH, it had increased power from its 1.8-litre turbocharged engine – rising to 240 PS (177 kW; 237 hp) and 320 N⋅m (236 lbf⋅ft) of torque – and a reduction in weight of 75 kg (165 lb) to 1,390 kg (3,064 lb), which allowed for a 0–62 mph (0–100 km/h) time of 5.9 seconds, and an electronically limited top speed of 155 mph (249 km/h). This weight reduction was achieved by removing the spare wheel, rear harmonic damper, rear parcel shelf and rear seats, and the standard fitment air conditioning. The main battery was also relocated to the rear of the vehicle in order to maintain weight distribution as much as possible. Lightweight fixed-back Recaro bucket seats graced the interior. Distinguishable from other TT Coupés by its two-tone paint scheme (Phantom Black pearl painted roof, pillars and mirror housings, in combination with either Avus Silver, Phantom Black, Mauritius Blue or Misano Red body colour) and unique 18" 15-spoke cast aluminium alloy wheels, plus the same body kit as fitted to the TT 3.2 V6, the TT quattro Sport also featured black exhaust tailpipes and uprated suspension settings and new wheels, ½" wider at the rear for improved handling. The brochure stated V6-spec brakes were to be fitted, however models delivered in the UK came with the standard 225 spec brake callipers which were red-painted. There were two United States class action lawsuits affecting specific model years of the first generation TT. 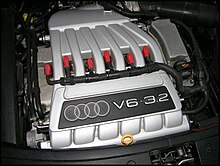 On 22 June 2007, Pearson, Simon, Soter, Warshaw & Penny, LLP and the Law Office of Robert L. Starr filed a class action lawsuit against Volkswagen Group of America, alleging that the timing belts for model year 1999–2003 Audi and Volkswagen vehicles equipped with a 1.8-litre turbocharged engine fail prematurely. The vehicles included are the Audi TT, Audi A4 and Volkswagen Passat. The complaint alleged that the timing belts failed prior to the service interval, as stated in the owner's manual. The parties have reached a class-wide settlement, and preliminary approval of the settlement was granted by the court on 19 May 2008. On 22 May 2008, the U.S. District Court, Northern District of California, entered an order preliminarily approving a nationwide settlement of a class action lawsuit brought by Green Welling LLP, on behalf of all current and prior owners and lessees of 2000–2004, and 2005 model year Audi TTs. The lawsuit and settlement related to allegedly defective instrument clusters, and Audi TT owners are entitled to submit claims for repairs, replacement and/or cash reimbursement for out-of-pocket expenses, and all TT owners covered by the suit will receive a two-year extension of their existing four-year warranty (limited to the instrument cluster). For the 30th anniversary Quattro gmbH unveiled an Imola Yellow TT that sported a 2.7 L Bi-Turbo V6 engine from a B5 Audi RS4 that produced 280 kW (381 PS; 375 hp) and 440 N⋅m (325 lb⋅ft) at 2,500 rpm which was manufactured in 2001. This was accomplished by using a B5 RS4 donor car, which included engine, transmission, rear differential, axles, brakes, and wheels from a B5 Avant. Using the RS4 drivetrain, Audi had the ability to utilize a Torsen based 6-speed Quattro manual transmission in a car that is normally using a transverse engine layout and r based all wheel drive system. In August 2004, Audi announced that the next generation TT would be manufactured using aluminium, and would go into production in 2007. A preview of the second-generation TT was provided in the form of the Audi Shooting Brake concept car, shown at the Tokyo Motor Show in 2005. This concept was an insight into the new TT, but featured angular styling, and a "shooting-brake" two-door hatchback body style. Audi debuted the second-generation TT, internal designation Type 8J, on 6 April 2006, using the Volkswagen Group A5 (PQ35) platform with aluminium front bodypanels, and steel in the rear, to enhance its near-neutral front-to-rear weight distribution. Available in front-wheel drive or 'quattro' four-wheel drive layout, the TT is again offered as a 2+2 Coupé, and as a two-seater Roadster. The second generation is five inches longer and three inches wider than its predecessor. Factory production commenced during August 2006. The powertrain options initially only included petrol engines, which consist of either one of two inline four-cylinder engines – the all-new 1.8-litre EA888 Turbocharged Fuel Stratified Injection (TFSI) (available initially only in Germany, later elsewhere from mid 2009), or the more common and established EA113-variant 2.0-litre TFSI. The Fuel Stratified Injection (FSI) technology was derived from the Audi Le Mans endurance race cars, and offers improved fuel efficiency as well as an increased power output and cleaner emissions. The 3.2-litre 'V6' badged VR6 engine is carried over from the previous generation, and this engine was also available in the Canadian model. 2.0 TFSI quattro models, with the latest EA888 engine, became available in 2009 model year. A six-speed manual transmission is standard, with the six-speed Direct-Shift Gearbox (now called "S-TRONIC" on all Audi models) as an option for all engines. Quattro on-demand four-wheel drive, again using the Haldex Traction clutch is available – standard on V6 models, but not available on the 1.8 TFSI. Like all its PQ35 platform-mates, the new 8J TT now has a multi-link fully independent rear suspension to complement the front independent suspension. The entire suspension system can be enhanced with Audi's new active suspension, "Audi Magnetic Ride", available as an option. This is based on BWI Group's MagneRide, which uses magneto rheological dampers (this means that an electronic control unit for the suspension will automatically adjust its damping properties depending on the current road conditions and driving manner). The new TT also features a revised rear spoiler which preserves the clean aesthetics of the TT when not raised. The spoiler automatically deploys at speeds greater than 78 mph (125 km/h) to increase down-force, and retracts again below 50 mph (80 km/h). The spoiler can also be manually controlled by the driver via a switch on the lower centre console. Manual operation by the switch reverts to automatic operation (i.e. : manual mode is cancelled) if the vehicle speed rises above the stated limit. Launched at the 2008 Geneva Motor Show, Audi offered the first diesel engined version of the Audi TT in the European market, the Audi TT 2.0 TDI quattro. As its name indicates, it is only available with quattro, and is also available in Coupé and Roadster versions. Power comes from the new 2.0-litre Turbocharged Direct Injection (TDI) engine, now with 16 valves, double overhead camshaft (DOHC), 1,800-bar (26,110 psi) common rail fuel delivery and eight-hole piezo fuel injectors, which produces a DIN-rated output of 125 kW (170 PS; 168 bhp) at 4,200 rpm and torque of 350 N⋅m (258 lbf⋅ft) at 1,750 to 2,500 rpm. It includes a six-speed manual transmission. Acceleration from standstill to 100 km/h (62.1 mph) on the Coupé is achieved in 7.5 seconds, and it will go on to reach a top speed of 226 km/h (140.4 mph). The slightly less aerodynamically efficient Roadster reaches 100 km/h (62 mph) in 7.7 seconds, with a top speed of 223 km/h (138.6 mph). Audi claim average fuel consumption for the Coupé variant with this 2.0 TDI engine is 5.3 litres per 100 kilometres (53.3 mpg‑imp; 44.4 mpg‑US), which achieves a CO2 emissions rating of 139 gram/km. The Roadster TDI achieves an average 5.5 litres per 100 kilometres (51.4 mpg‑imp; 42.8 mpg‑US) and CO2 of 144 gram/km. As an additional package a standard Audi TT can be bought from factory with a special body kit upgrade to make it look like the Audi TT-RS version. The upgrade includes a fixed rear spoiler, and Alcantara/leather sports seats (Silk Nappa, Fine Nappa leather optional). At the 2008 North American International Auto Show (NAIAS) in Detroit, Audi released the first Audi "S" model of the TT range – the Audi TTS quattro, with a heavily revised 2.0 TFSI engine. The cylinder block, cylinder head and the fuel injectors have all been modified from the base 2.0 TFSI engine (ID: CDL). Together with other modifications, this engine produces a DIN-rated power output of 200 kW (272 PS; 268 bhp), and generates a torque of 350 N⋅m (258 lbf⋅ft) from 2,500 to 5,000 rpm. It was available with a choice of either a six-speed close-ratio manual transmission, or a six-speed 'S tronic' transmission. In the United States, the S tronic gearbox was the only available transmission. Like all Audi "S" models, it was only available with quattro four-wheel drive as standard. The suspension was lowered by 10 millimetres (0.4 in) over the standard models, and includes "Audi Magnetic Ride" as standard and a new two-stage sports-biased Electronic Stability Programme (ESP). Radially ventilated front disc brakes are clamped by a single-piston gloss black caliper emblazoned with a bold TTS logo, and a lap timer is prominent in the centre of the instrument cluster. 9Jx18" '5-parallel-spoke' design alloy wheels are standard, with 245/40 ZR18 high-performance tyres. 19" '5-spoke star' wheels and tyres are optional. The exterior has some changes over the standard model – with a TTS body styling: with redesigned front, with larger air intakes, redesigned rear bumper, side sill extensions, and four exhaust tailpipes. Official performance figures include a 0–62 mph (0–100 km/h) acceleration time of 5.2 seconds, with the Roadster four-tenths slower at 5.6 seconds. Top speed is electronically limited to 155 mph (249 km/h). Audi UK offered eight TTS cars for official use by the race organisers at the 2008 Isle of Man TT motorcycle races. The car went on sale in the USA at November 2008. In 2014, at the International Motor Show in Geneva, Audi unveiled the new TTS model for the 2016 model year, alongside the standard 2016 Audi TT model. Both models were planned to go on sale in the beginning of 2015. Audi displayed a new show car variant of the second generation Audi TT – the Audi TT Clubsport quattro, at the 2008 Wörthersee Tour at Pörtschach am Wörthersee in Austria. Shown only in an open-topped 'speedster' variant, its 2.0 TFSI engine has been tuned to give 221 kW (300 PS; 296 bhp). The soft-top on the standard TT Roadster has been deleted, and replaced with two 'humps', along with two substantial roll bars. LED daytime running lamps, an aggressive body kit with large frontal air intakes, black-painted 'single frame grille' and a lower spoiler lip complete the new look from the front. The axle track has been widened by 66 millimetres (2.6 in), with bolder and wider wheel arch extensions, polished 19-inch alloys, wider side sills and 255-section tyres are the highlight of the side profile. At the rear, twin polished stainless steel oval tail pipes exit aside a new rear diffuser. Racing bucket seats, along with lightweight aluminium detail complete the interior look, and a six-speed S tronic dual-clutch transmission with quattro four-wheel drive and TTS spec brakes (340 mm (13.4 in) up front, and 310 mm (12.2 in) at the rear) complete the mechanicals. Whilst the TT Clubsport quattro is primarily a 'show car', Audi has not ruled out the possibility of small-scale production. With its world debut at the 2009 Geneva Auto Show, and developed by Audi's high-performance subsidiary quattro GmbH at Neckarsulm, Germany, Audi released the first ever compact sports car Audi "RS" variant – the Audi TT RS, which was available from 2009 in Coupé and Roadster variants. The TT RS featured an all-new 2.5-litre Inline-5 turbocharged petrol engine. This new 183 kg (403 lb) engine produces a DIN-rated power output of 250 kW (340 PS; 335 bhp) from 5,400 to 6,700 rpm, and torque of 450 N⋅m (332 lbf⋅ft) at 1,600–5,300 rpm. Ever since the original Audi "RS" model – the Audi RS2 Avant – all Audi "RS" models were assembled at the quattro GmbH factory in Neckarsulm. The TT RS is the first Audi RS vehicle that didn't have any of its assembly performed in Neckarsulm but was completely assembled in the Audi factory in Győr, Hungary, alongside the base Audi TT. The TT RS has a new short-shift close-ratio six-speed manual transmission, and like all "RS" models, is only available with Audi's 'trademark' quattro four-wheel-drive system, with the TT RS using a specially adapted version of the latest generation multi-plate clutch from Haldex Traction. Additions to the quattro system include a constant velocity joint before the cardan propeller shaft, and a compact rear-axle differential – upgraded to cope with the increased torque from the five-cylinder turbo engine. Like the TTS, the TT RS has a 10 millimetres (0.4 in) lower ride height, optional "Audi Magnetic Ride", and rides on standard 18-inch wheels with 245/45 ZR18 tyres (optional 19" or 20" wheels are also available). The brakes are upgraded to include two-piece cross-drilled and radially vented front discs, sized at 370 mm (14.6 in) in diameter. The front discs are clamped by gloss black painted four-piston calipers, adorned with the RS logo. Rear ventilated discs are sized at 310 mm (12.2 in) in diameter. It includes a fixed rear spoiler (retractable optional), and has black interior with heated Alcantara/leather sports seats (Silk Nappa, Fine Nappa leather optional). The Recaro "RS bucket" seats, first seen in the Audi B7 RS4 are also available as an option. Also carried over from the B7 RS4 is the 'Sport' button, which sharpens the throttle response and deepens the exhaust note, and a three-stage user-selectable Electronic Stability Programme (ESP). Official performance figures indicate the TT RS Coupé will accelerate from a standstill to 100 km/h (62.1 mph) in 4.5 seconds (4.7 seconds for the Roadster), with an electronically limited top speed of 250 km/h (155 mph). There is a factory option to de-restrict the top speed to 280 km/h (174.0 mph). The Coupé has a kerb weight of 1,450 kg (3,197 lb), and the Roadster weighs in at 1,510 kg (3,329 lb). As of 2010 the TT-RS is available with the 7-speed DSG automatic transmission capable of handling the torque delivered by the engine. The 6-speed gearbox used in the TT-S cannot cope with 450 N⋅m (332 lbf⋅ft) which is why the TT-RS initially was offered only with a manual transmission. The car went on sale in March 2009, with delivery beginning in summer. In 2010, the TT-RS was confirmed for the US market. The decision was influenced by an internet petition to bring the TT-RS stateside, which succeeded with over 11,000 signatures. The TT-RS arrived in Q3 2011 as a 2012 model. In 2012, the TT RS plus was launched. It featured the uprated version of the TT RS' engine that had originally been developed for the RS Q3 concept car; this version of the engine produces 355 hp (265 kW; 360 PS) at 5500 rpm, and 343 lb⋅ft (465 N⋅m) of torque at 1650 rpm. As a result of this power increase, Audi claimed that the 0-62 mph (100 km/h) time had decreased to 4.3 seconds for the manual version, and 4.1 seconds for the S-tronic version. In addition to this, Audi raised the top speed limiter, with the TT RS plus being restricted to 174 mph (280 km/h). Audi was reported to stop offering 3.2-litre V6 (VR6) models in North America from 2010 model year. The second generation TT has been honoured with many awards, including the inaugural Drive Car of the Year, Top Gear Coupé of the Year 2006, Fifth Gear Car of the Year 2006, Autobild Most Beautiful Car, and World Design Car of the Year 2007, as well as being a finalist for World Car of the Year. In addition, an HPA-prepared version of the car was the winner of the SEMA Gran Turismo Award in 2007.The Audi TT has been the What Car? best Coupe of the Year for six consecutive years since 2007. Like its predecessor, the Audi TT FV/8S was previewed in the form of the Audi Allroad Shooting Brake concept car, shown at the Detroit Motor Show in 2014. The third generation of the TT was unveiled at the 2014 Geneva Motor Show. The FV/8S generation utilises the Volkswagen Group MQB platform, and is available with a choice of TFSI and TDI engines. The 2.0 TFSI is available in two versions: a version producing 169 kW (230 PS; 227 hp) and 370 Nm (272.90 lb-ft) of torque in the TT and a version producing 228 kW (310 PS; 306 hp) and 380 Nm (280.27 lb-ft) of torque in the TTS. A 2.0 TDI Inline-four engine producing 135 kW (184 PS; 181 hp) and 380 Nm (280.27 lb-ft) of torque is also available as an option for the TT. The TFSI engines are available with quattro all wheel drive. The TDI comes in front wheel drive configuration. The interior of the third generation Audi TT is notable for its HVAC design, featuring temperature and airflow controls that are embedded in the air-vents themselves, hence improving ergonomics. In the US, this generation was available from Model Year 2016 onward. In 2016, the MQB-based Audi TT RS coupé and roadster were announced with the five-cylinder 2.5 litre TFSI engine now producing 294 kW (400 PS; 394 hp) and 480 Nm (354 ft-lbs) of torque between 1,700 and 5,850 rpm. Audi's all-wheel drive quattro system is the standard layout and the only transmission option is the 7-speed S tronic automatic transmission. In auto racing, the Istook's Motorsports team has currently entered a Revo Technik-sponsored Audi TT in the Grand-Am KONI Sports Car Challenge Street Tuner (ST) class. Under the racing name of RS Werkes, Istook's Motorsports out of Fort Worth, Texas, built and raced the first TT RS brought into the United States in the Grand Am GS class in 2012, 2013 and 2014. An Audi TT RS was used in 2009 24 Hours of Le Mans race as safety car. The Abt Sportsline team entered a TT into the DTM, and Laurent Aïello took the title in 2002. Istook's Motorsports has also raced the TT in SCCA's World Challenge race series. Because of their racing involvement, they received the first U.S. Version of the TT-RS in July 2011. The Audi TT Offroad Concept was unveiled as an SUV concept version of the Audi TT at the 2014 Auto China. The SUV utilized a hybrid system coupled with the 2.0-litre TFSI Inline-4 engine producing a total of 304 kW (413 PS; 408 hp) and 649 N⋅m (479 lb⋅ft) of torque. The SUV utilises a 6-speed dual clutch automatic transmission. The hybrid system consists of a 40 kW (54 PS; 54 hp) electric motor on the front axle and a 85 kW (116 PS; 114 hp) electric motor on the rear axle. In full EV mode, the vehicle uses the rear motor only; Hybrid and Sport modes utilise all three power sources, and all-wheel-drive traction is applied as needed. Performance figures include a 0–62 mph (0–100 km/h) acceleration time of 5.2 seconds and an electronically limited top speed of 155 mph (249 km/h). The distinguishing features of the concept include matrix LED headlights and two new assistance systems: One that scans intersections for potentially dangerous situations, and a second that connects to a municipality's traffic-light system in order to recommend a perfect speed to reach the next light when it’s green. The interior is relatively close to the TT's with leather upholstery from Italian fashion brand Poltrona Frau and features a high-tech TFT display in front of the driver populated with the information that would normally be projected onto a central, dash-mounted screen—i.e. navigation, entertainment. The trunk of the vehicle contains a 1:8 scale RC car as a souvenir. Lewandowski, Jürgen, Staretz, David, Völker, Herbert: Das TT Buch. Delius Klasing, Bielefeld 1999, ISBN 3-7688-1117-4. Maxeiner, Dirk, Lewandowski, Jürgen, Vann, Peter: Excittement – Die neue Generation des Audi TT. Delius Klasing, Bielefeld 2006, ISBN 3-7688-1881-0. ^ "Audi TT: a design history". Auto Express. ^ "Györ production plant overview". www.audi.com. Audi. ^ Noah Joseph. "Audi starts production of new TT in Hungary". Autoblog. ^ a b Patton, Phil (May 2001). "Would you buy a Concept Car from this man?". Metropolis Magazine. Bellerophon Publications. Archived from the original on 8 March 2009. Retrieved 4 January 2010. ^ a b c "Audi TT". CarAutoPortal.com. Car Auto Portal, Inc. Archived from the original on 13 December 2009. Retrieved 4 January 2010. ^ "Porträt Peter Schreyer: Kia-Chefdesigner und Künstler". Auto, Motor und Sport. 9 May 2009. Zu den wichtigsten Entwürfen, die in seiner Zeit als Audi-Designchef entstanden, zählt er den Audi TT und den A2 . ^ "Who's Where: Martin Smith joins Ford Europe design team". Car Design News. Ultima Media. 26 February 2004. Retrieved 4 January 2010. ^ "2001 Audi TT Roadster – short take road test". Car and Driver. Hachette Filipacchi Media U.S., Inc. July 2000. Retrieved 29 December 2009. ^ "Volkswagen DSG – World's first dual-clutch gearbox in a production car". Volkswagen-Media-Services.com. Volkswagen AG. 22 November 2002. Archived from the original on 24 May 2006. Retrieved 30 October 2009. ^ a b "Audi TT-S to be official car of the Tourist Trophy races". AutoBlog.com. AUDI AG. 25 April 2008. Retrieved 24 December 2009. ^ Lewandowski, Jürgen; David Staretz; Herbert Völker (1999). Das TT Buch (in German). Delius Klasing. ISBN 3-7688-1117-4. ^ "2000 Audi TT Recalls". Retrieved 21 September 2017. ^ a b c d e f "Audi TT quattro Sport revealed". WorldCarFans.com. AUDI AG. 22 February 2005. Retrieved 4 January 2010. ^ "TimingBeltSettlement.com" (PDF). Archived from the original (PDF) on 6 February 2009. Retrieved 2 January 2009. ^ "Audi TT Instrument Cluster Settlement". Green Welling LLP. Retrieved 25 December 2009. ^ Achorn, George. "This Never Seen Audi TT Prototype Could Eat Porsche 911s For Breakfast". Jalopnik. Retrieved 14 February 2018. ^ "Next-generation Audi TTs to be made of aluminum". autoweek.com. 8 August 2004. Retrieved 12 June 2015. ^ "Audi TT Shooting Brake to debut at Tokyo". Autoblog.com. Weblogs, Inc. 11 October 2005. Retrieved 25 December 2009. ^ a b "2008 Audi TT – CarGurus' review". CarGurus.com. Retrieved 4 January 2010. ^ a b "Audi TT Roadster slims down for Summer". audi.co.uk. Audi UK. 23 March 2009. Archived from the original on 19 May 2011. Retrieved 4 January 2010. ^ "2009 Audi TT / TTS" (PDF). Archived from the original (PDF) on 20 April 2009. ^ a b c d e "50 mpg-plus Audi diesel sports car cleans up in Geneva". audi.co.uk. Audi UK. 28 February 2008. Archived from the original on 1 August 2010. Retrieved 4 January 2010. ^ a b c d e f g h i j "Audi's new TT TDI is going on sale this spring in Europe". Green.AutoBlog.com. AUDI AG. 28 April 2008. Retrieved 4 January 2010. ^ a b "Audi TT TDIs debut – but not in U.S." edmunds.com. Edmunds. 29 April 2008. Retrieved 4 January 2010. ^ a b c d e f g h i j k l "High performance Audi TTS debuts in Detroit". audi.co.uk. Audi UK. 10 January 2008. Archived from the original on 19 May 2011. Retrieved 25 December 2009. ^ "TTS Coupé – Powerful 2.0 TFSI engine". audi.co.uk. Audi UK. Archived from the original on 28 December 2009. Retrieved 4 January 2010. ^ "TTS Coupé – Handling – Audi Magnetic Ride, 'S' version". audi.co.uk. Audi UK. Archived from the original on 21 February 2011. Retrieved 4 January 2010. ^ "TTS Coupé – Handling – ESP with sport mode". audi.co.uk. Audi UK. Archived from the original on 21 February 2011. Retrieved 4 January 2010. ^ "TTS Coupé – Handling – enhanced braking system". audi.co.uk. Audi UK. Archived from the original on 21 February 2011. Retrieved 4 January 2010. ^ "Pricing set for UK-bound Audi TTS Coupé and Roadster". audi.co.uk. Audi UK. 14 February 2008. Archived from the original on 19 May 2011. Retrieved 25 December 2009. ^ "New Audi TT on course for spiritual Isle of Man homecoming". audi.co.uk. Audi UK. 25 April 2008. Archived from the original on 19 May 2011. Retrieved 25 December 2009. ^ "Audi TTS due in November". Wheels.ca. Chrome Systems, Inc. 14 January 2008. Retrieved 4 January 2010. ^ "2016 Audi TT and TTS Review". ^ a b c d e f g h i "Return of the Audi TT Clubsport quattro". audi.co.uk. Audi UK. 23 May 2008. Archived from the original on 19 May 2011. Retrieved 4 January 2010. ^ "The Audi TT RS: sporty powerhouse with five cylinders". audi.co.uk. Audi UK. 24 February 2009. Archived from the original on 19 May 2011. Retrieved 4 January 2010. ^ a b c d e f g h i j k l m n o p "Potent new Audi TT RS takes five in Geneva". audi.co.uk. Audi UK. 3 March 2009. Archived from the original on 19 May 2011. Retrieved 4 January 2010. ^ "Geneva 2009: 2010 Audi TT RS". Autoblog.com. ^ Stertz, Bradley (14 September 2010). "Confirmed: Audi TT RS coming to America". Audi of America. Archived from the original on 24 September 2012. Retrieved 31 May 2014. ^ a b c Metcalfe, Harry (4 June 2013). "2013 Audi TT RS Plus review and pictures". evo. Archived from the original on 11 June 2015. Retrieved 1 May 2015. ^ "Audi dropping 3.2-liter V6 from 2010 A3, A4 and TT". AutoBlog.com. Weblogs, Inc. 22 April 2009. Retrieved 24 December 2009. ^ Blackley, Julie. "The Longest-Lasting Cars to Reach 200,000 Miles and Beyond". iSeeCars.com. Retrieved 15 March 2019. ^ "Audi Allroad Shooting Brake Concept: The Next TT in Disguise". caranddriver.com. Retrieved 25 December 2014. ^ "2016 Audi TT: Third Generation of a Design Icon". caranddriver.com. ^ "Emotion, dynamism and high-tech – The new Audi TT". audi-mediaservices.com. Retrieved 25 December 2014. ^ "Audi TT air vent design". www.deeptread.com. Deep Tread. 21 November 2016. ^ "Warning – The 2015 Audi TT is not the new TT Audi promised | Torque News". Torque News. Retrieved 14 July 2018. ^ "New Audi TT RS, Audi TT RS 2016, Audi TT RS Coupe, Audi TT RS Roadster - zero60 Cars". www.zero60cars.co.uk. Retrieved 1 December 2016. ^ Audi.co.uk. "All-new Audi TT RS Coupé". Audi UK. Retrieved 1 December 2016. ^ PaddockTalk. "Le Mans 24: News From The Audi Team". Paddocktalk.com. Archived from the original on 8 September 2012. Retrieved 20 October 2010. ^ "ABT Audi TT-Limited II". NetCarShow.com. ^ WHEL. 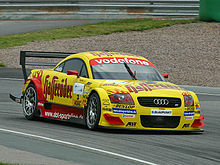 "WHEL - Cars – Abt Audi TT-R, DTM 2002". whel.de. Archived from the original on 14 January 2012. ^ "Audi celebrate 500,000 worldwide TT sales with new TTS Limited Edition". FleetPoint. ^ "Audi TT Offroad Concept". Car and Driver. Retrieved 15 June 2018. ^ "Audi TT Offroad Concept revealed". caradvice.com.au/. 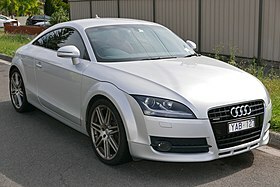 Wikimedia Commons has media related to Audi TT.